The PC2 features many incredible new sounds not found on any previous Kurzweil models, including a triple strike stereo grand piano, our new lush stereo strings, newly recorded multi-strike classic electric pianos (both Fender Rhodes(TM) and Wurlitzer(TM)), brass sections, drums, percussion, voices (featuring Kurzweil's outstanding Take 6 vocal samples), and more. 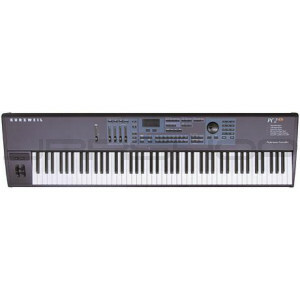 It also features Kurzweil's KB-3 modeled tone wheel organ mode, giving you ultra-realistic tone wheel organ programs. Orchestral Sounds include String Sections, Solo Strings, Woodwinds, Orchestral Brass, Jazz Brass, Orchestral Ensembles, Choir, Organ, Harp, Nylon String Guitar, Orchestral Percussion, and Ethnic Percussion. Additional sound include mallet percussion, guitar, bass, Clavinet(TM), harpsichord, synth sounds, and more. The PC2 comes with 400 fantastic sounding preset programs (256 regular programs, 128 Orchestral ROM programs, and 16 KB3 programs). All programs can be edited, allowing for changes to timbre, envelopes, and LFOs. They can then be stored to any of the 256 user locations (128 for regular programs and 128 for KB3 programs).One additional ROM block can be added to the PC2 (to be released in the future), which will add 128 more preset programs. (For older units that came with the Orchestral ROM, it can be added as an option). And with 64 voices of polyphony, expandable to 128 voices, you'll never run out of polyphony for playing all of the marvelous sounds. The Orchestral ROM block comes with 2 banks of 128 programs. Our own unique programs are installed in the Flash ROM. A General MIDI bank is also available, which can be loaded into theater Bank. Or, if desired, you can install the GM bank of sounds as presets into the Flash ROM, and then load our unique bank of sounds into the User bank. Controllers: Pitch wheel, modulation wheel, 4 front panel sliders, 5 front panel switches (momentary or toggle, software selectable), 2 continuous control pedal inputs, 3 footswitch inputs, mono pressure, breath controller input, Kurzweil Ribbon input. MIDI: Transmits on 4 channels, Receives on 16 channels. In, Out, Thru (hardware switchable to copy of MIDI Out). Max Polyphony: 64 (128 with the Polyphony Expansion option), dynamically allocated. Internal Voices: 272 Internal Voice programs. 256 Regular Programs include Grand Piano, Tine E. Piano, FM E. Piano, Ensemble Strings, Voices, Organ, Harpsichord, Clav, Vibes, Marimba, Electric Bass & Acoustic Bass (with and without layered Ride Cymbal), Acoustic Guitar, Drums, Percussion, Synth Pads. Orchestral ROM Block includes String Sections, Solo Strings, Woodwinds, Orchestral Brass, Jazz Brass, Orchestral Ensembles, Choir, Organ, Harp, Nylon String Guitar, Orchestral Percussion, and Ethnic Percussion. 16 KB3 Programs use Kurzweil's modeled tone wheel organ mode. General MIDI Bank also available. 256 locations for User created programs (128 for regular programs and 128 for KB3 programs). Expandable with an optional ROM black which adds 128 preset programs and 32 preset Setups. Processor B effects: 30 Reverbs including booths, rooms, chambers, halls, and plates. Flash ROM (for software updates via system exclusive dumps). The current version of the operating system is v3.10. The operating system in your unit is displayed on power up. Click here to download version 3.10 from our FTP site. Outputs: 2 Analog Outputs (1/4 in. jack Left/Mono and Right), Stereo Digital Output (RCA jack, with AES/EBU and SPDIF formats selectable), Stereo headphone out. MIDI Setups: 128 user programmable MIDI setups, each with 4 independent zones, effects and arpeggiator settings. 64 factory programmed MIDI setups. Power: 9V AC external power supply.